Happy Halloween weekend! 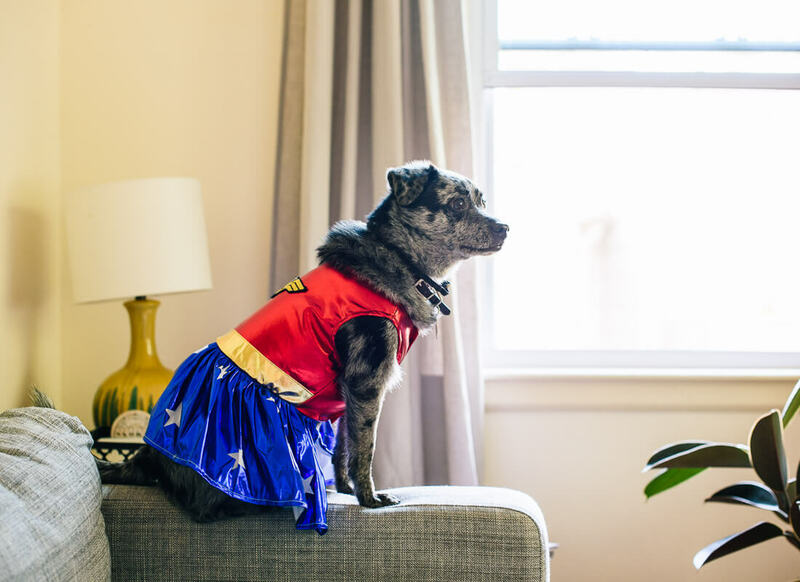 Cookie’s prancing around in her Wonder Woman costume (photo below! ), and I crashed a friend’s office Halloween party yesterday. It’ll be quite a successful Halloween once I get my hands on some peanut butter cups. Trader Joe’s dark chocolate minis are my favorite. I don’t suppose this roasted cauliflower recipe has much to do with Halloween, but it is the perfect side dish for fall and winter. I don’t get excited about raw cauliflower. 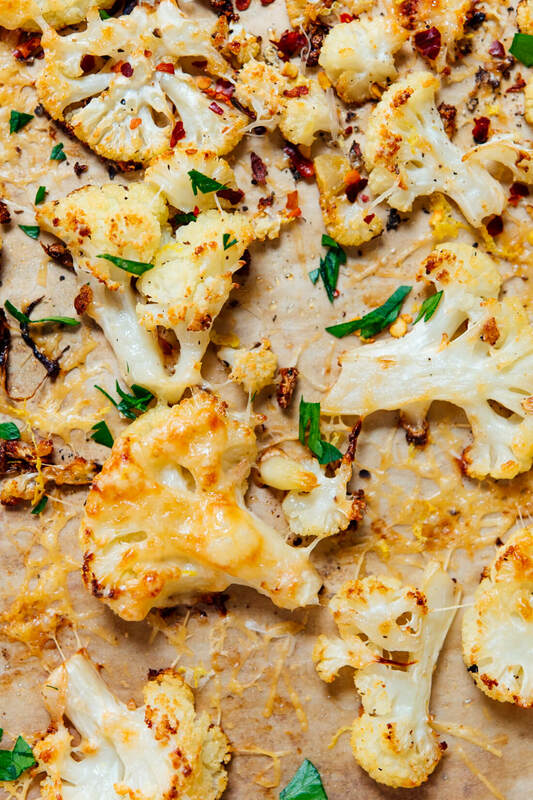 Roasted cauliflower, though—I’m obsessed. Have you tried it? 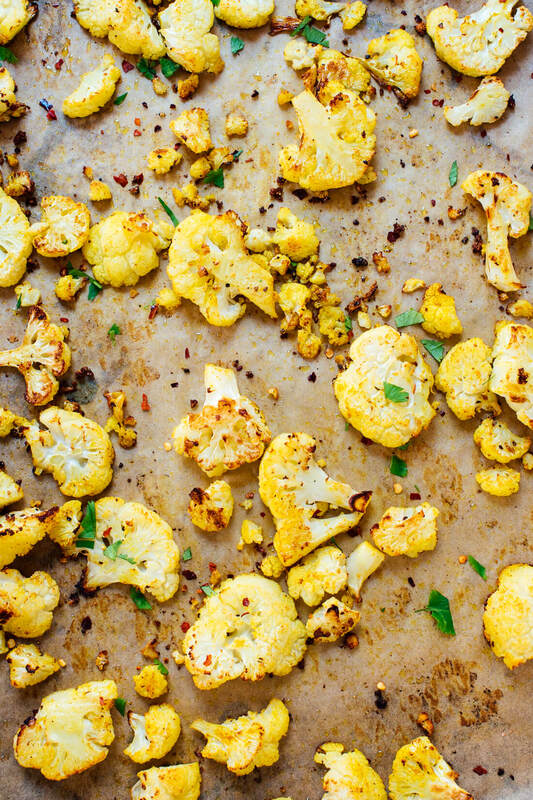 Raw cauliflower transforms into golden, caramelized deliciousness in the oven. If you roast it with just olive oil, salt and pepper, it’s a tasty snack (I could eat it like French fries). You can also use basic roasted cauliflower to add bulk and tasty roasted flavor to other veggie dishes, like my lentil tacos and farro salad. It’s neutral enough that it doesn’t overwhelm other flavors, so it goes well with a variety of cuisines. As much as I love basic roasted cauliflower, it’s the perfect vehicle for creative flavorings. I came up with three amazing flavor combinations this week, and I can’t decide which one I love best! The Mexican version is spiced with cumin and chili powder, and I added pepitas halfway through cooking so they get nice and toasty. Garnish with cilantro and lime zest for the perfect Mexican side dish for my veggie enchiladas! For the Indian version, I tossed the cauliflower with curry powder before roasting, and finished it off with cilantro and red pepper flakes, for extra kick. Just try not to eat it all right off the pan. :) Which version is your favorite? 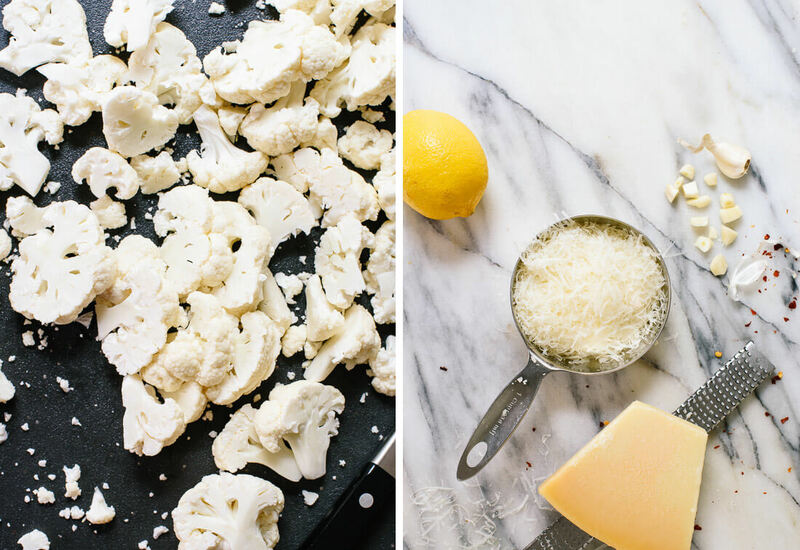 Learn how to roast cauliflower, plus three delicious variations! 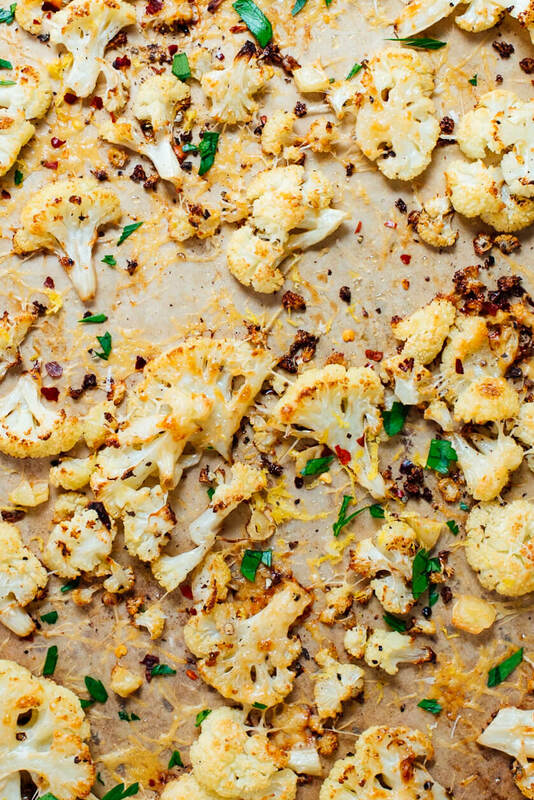 You’ll find Italian, Mexican and Indian versions with this roasted cauliflower recipe. Recipe yields 4 side servings of roasted cauliflower. 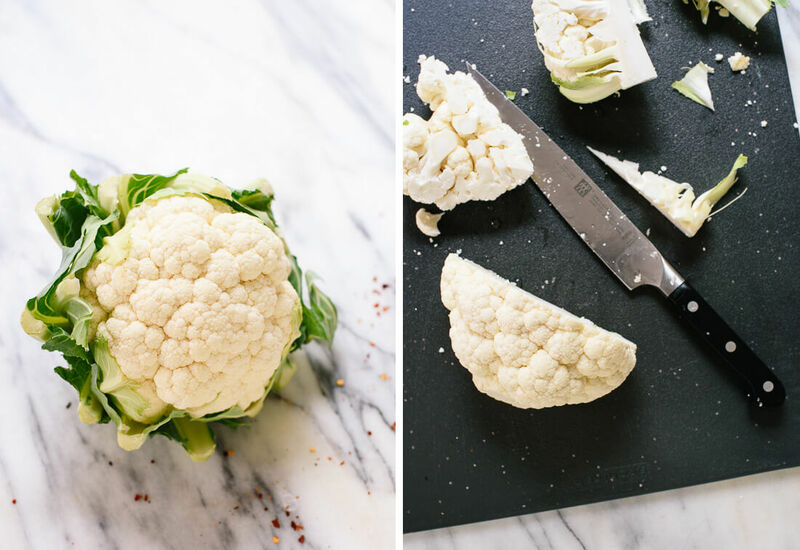 To prepare the cauliflower, use a chef’s knife to slice off the nubby base, then quarter it into four even wedges. Slice off the inner core areas, leaving the rest intact (see photo). Then slice each piece into ½″ wide pieces, breaking apart any particularly large florets. Place the cauliflower on the prepared baking sheet, drizzle with 2 tablespoons olive oil, and sprinkle liberally with salt and pepper. Toss until the ingredients are evenly distributed and the cauliflower is lightly coated in oil, adding drizzle of oil if necessary. If you’re making basic roasted cauliflower, arrange the cauliflower in an even layer and bake until it’s deeply golden on the edges, tossing halfway, about 25 to 30 minutes. If you’re making the Italian version, arrange the cauliflower in an even layer and bake for 15 minutes. 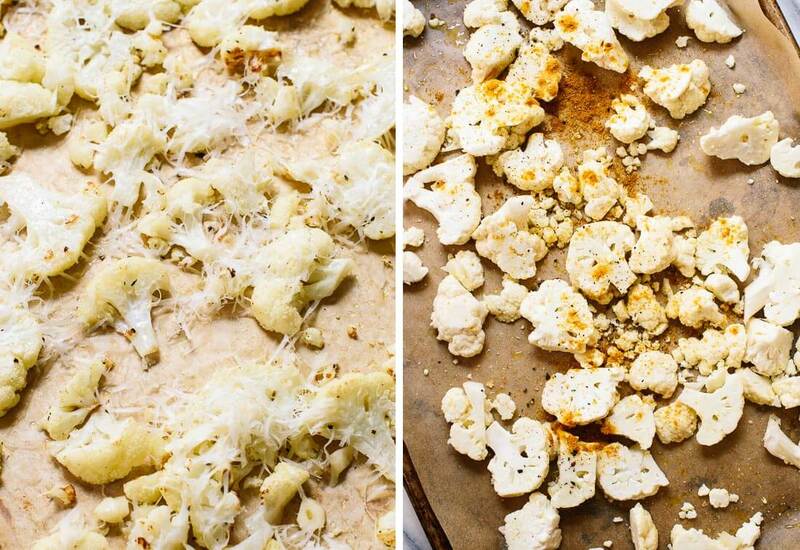 Remove from the oven, toss, and then sprinkle the Parmesan over the cauliflower. Return to the oven and bake until the cauliflower is deeply golden on the edges, about 10 to 15 more minutes. Sprinkle the cauliflower with parsley, lemon zest, and red pepper flakes (if using). If you’re making the Mexican version, sprinkle the cauliflower with cumin and chili powder and toss until well blended. Arrange the cauliflower in an even layer and bake for 15 minutes. Remove from the oven, toss, and sprinkle the pepitas over the center area of the pan (if you sprinkle them too close to the edges, they might burn). Return to the oven and bake until the cauliflower is deeply golden on the edges, about 10 to 15 more minutes. 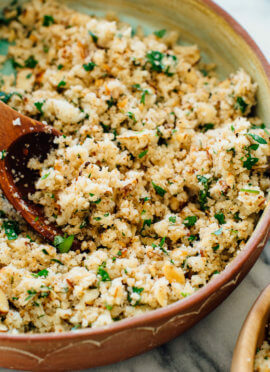 Sprinkle the cauliflower with cilantro and lemon zest. If you’re making the Indian version, sprinkle the cauliflower with curry powder and toss until well blended. Arrange the cauliflower in an even layer and bake until it’s deeply golden on the edges, tossing halfway, about 25 to 30 minutes. 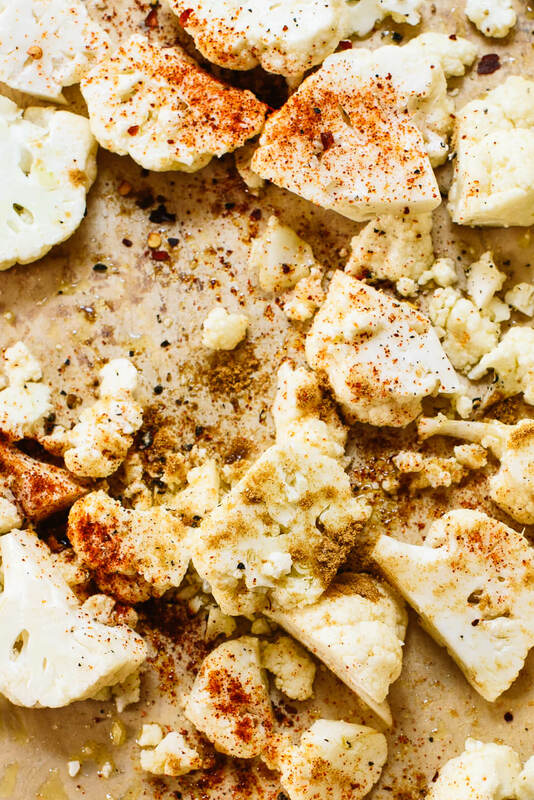 Sprinkle the cauliflower with cilantro and red pepper flakes (if using). 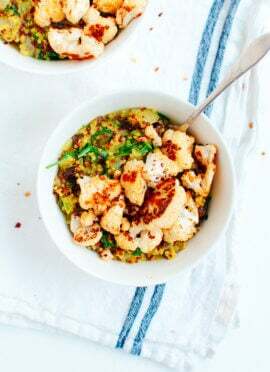 Recipe adapted from Bon Appetit and my curried coconut quinoa with roasted cauliflower. Make it dairy free/vegan: For the Italian version, omit the Parmesan or sprinkle on vegan Parmesan after baking. All the other variations are dairy free as written. Recommended equipment: A Microplane (affiliate link) is the perfect tool for finely grating Parmesan and removing the zest from lemons and limes. Thank you, Laura! It’s been too long. Thank you, Lynne! Curry and cauliflower go great together. I have two heads of cauliflower that are just waiting to be roasted. Thank you for the new ideas. And Cookie is adorable!! Thanks, Michelle! Glad you’re putting that cauliflower to good use. Cauliflower is one of the veggies I enjoy roasting. I prefer it plain (olive oil, salt & pepper). If you want to have even more flavor, try one of the colored cauliflowers (I’ve tried the purple and the orange/yellow). They have a nicer flavor than the white. You know, I’ve never bought one of the colorful cauliflowers. I’ll have to try some soon. Thanks, Susan! But, I digress… My other daughter loves cauliflower, I used to get the frozen kind when she still lived at home… I’d mash the heck out of it & put in butter, sour cream & salt & pepper. I think we would all love this, & more healthy too!!! Thank you for being my introduction to this world, and look forward to hearing more about you & Cookie & your interesting recipes!!! Ps: hope this wasn’t too long, not sure of the etiquette…. Hey Blayne! Thank you so much for your note. I wish I could see that puppy! I bet she loves being the school mascot. Cookie loves attention, too. I should really try mashing cauliflower like you described; I bet it’s a great alternative to mashed potatoes. I hope you enjoy my recipes! All my best. Ha! I also love roasted cauliflower. You can make it Halloween-y by roasting it whole and pouring beet juice over it! It looks like a bbbrrrraaaiiinnnn!!!!!! Never would have thought of that! Love it. All of these combinations look delicious! Thanks for sharing! Cookie looks SO CUTE in her supergirl costume!! I love roasted veggies, especially broccoli and cauliflower! Love roasted cauliflower. Can’t wait to try your versions. I bet Gidget looks great! Cookie loves wearing outfits, but she strangely wasn’t as excited about the Wonder Woman outfit. Maybe it was a little too flashy? Hehe. Thank you for these recipes – I love roasted cauliflower and these suggestions for different ways of making it are so great. First, Parmesan is not vegetarian – there are vegetarian versions of Parmesan, but these are often called something else (sometimes ‘parmesan-like’). Parmesan is by definition made with animal rennet (I live in Europe so this might not be true for US-made Parmesan, but it will be true for imported Parmesans in the US. In the US, it is at least worth checking the label). Since lots of veggies don’t realise this, it might be worth making it clear in recipes. Second, so many curry powders are awful (and curry powder is a Western invention so this cauliflower isn’t *really* Indian). How about using garam masala instead? Or making one’s own spice mix is so easy (dried cumin, dried coriander, turmeric and chili could be the basic, but then you could add fennel seeds and ginger and mustard seeds and nutmeg and and and … – all of which would be amazing on cauliflower don’t you think?). Arg – I just reread and saw you did make a note about veggie parmeson – apologies and ignore the parm comment!! Hi Dina, glad you saw my note on the Parmesan. It’s just called vegetarian Parmesan here. You could definitely try garam masala or make your own spice blend for the “Indian” version. Feel free to make it your own! I strive to make my recipes accessible and easy to make, so curry powder fit the bill. Garam masala isn’t so easy to find here. I love Cookie’s costume. And what a great, creative idea. I will either start with the Mexican or Indian version. Yum! I want to try the mexican version with pepitas first! Thanks, Kate! Hope you love it! Roasted cauliflower is a revelation. I just recently made your lentil and cauliflower tacos, which were incredible. I think the next time I make them I might use your Mexican roasted cauliflower. Yes please. I just made the “Italian version” a few weeks ago (recipe not from your site) and it was so amazing. Your recipe is very similar, so I have to give it 5 stars. 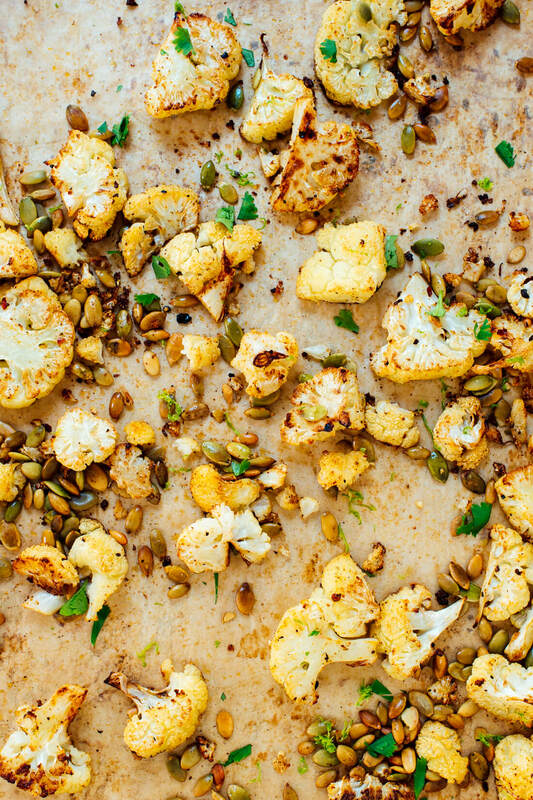 Who knew roasted cauliflower was actually delicious?? I’m going to make it for a Thanksgiving side dish. I’m excited to try the Indian version – sounds delicious. I should clarify that I added sliced garlic in my Italian version. I definitely recommend it. Thanks, Jen! I appreciate it. I played around with garlic but couldn’t decide if it was essential or not. It’s easy to burn, and burned garlic is the worst. Glad to hear your vote for it! Yum! Which way to try first….? This looks so yummy! I just made your curried roasted cauliflower soup this weekend, and it was unlike any soup I’ve had before. Thanks for introducing me to roasted cauliflower! Your blog is my favourite food blog. Happy Halloween, Kate! Thank you so much, Sara! Delighted to hear it. Hope you had a great Halloween! Perfect! Hope you enjoy these. I use cauliflower quite a bit but I’ve never roasted it! Now I’ve read your recommendation of it, I’ll give it a go. I think I’ll try the Italian version first but they all look delicious. Btw the Wonder Woman outfit is adorable, love it! Such a great way to do cauliflower! Yum… I need to try this. A friend made roasted cauliflower (but on the grill) this summer, and somehow it was the best thing I had that evening (I don’t know how, though, because there was a lot of good food). It was an Indian-ish version, but with cumin and salt (I think). I tried to recreate it but really couldn’t. I need him to make it again soon. My “Indian” version is tumeric, black mustard seeds, whole cumin seeds. Cookie is an adorable Wonder Woman! I am not a huge fan of cauliflower and was looking for a way to roast some flavour in. Thank you for the vegetarian ideas. Much appreciated. I love receiving your emails. Thanks, Terri! I’m glad to hear that. I don’t love raw cauliflower, but roasted is awesome. Hope you enjoy these variations. She says thank you, Karen! :) Hope you enjoy the cauliflower. Hi Kate, I love your blog and have tried many of the recipes here! 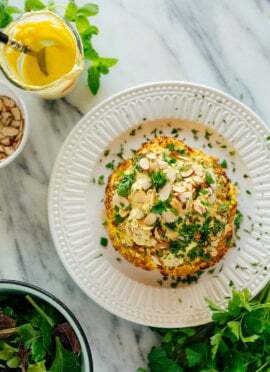 I am looking for a cauliflower steak recipe today and was wondering if you have one to share.. Thanks! Hi, Eve! I’m glad you enjoy the blog. I do have a recipe that involves cauliflower steaks: my Parmesan-crusted cauliflower steaks with marinara. Let me know if you try it! ooh what lovely ideas! Inspired by your curry version, I decided to do one with just the turmeric and salt.. and I’m definitely trying the parmesan one.. mmm yum!! I made the Italian version of this recipe and it turned out so well! It made me feel like I finally cracked the cauliflower preparation code. I’ll definitely be making it again and can’t wait to try the other versions! Thank you! Hooray! Great. Thank you for giving it a try and leaving a review. I appreciate it, Krystal. I just made the Mexican version. Thanks! Everyone loved it. What other dish goes with this cauliflower. For a little bit picky eaters. There are a lot of dishes that would go well, it depends on what your picky eaters don’t like. Check-out the dinner section of the website for some ideas! Hope this helps, Meg. My hubbie made the Italian version. We didn’t have any lemons so we used lemon pepper instead. My son said it was the best cauliflower ever. Tasty! Thanks for sharing, Elizabeth. So yummy! I used crushed garlic in my olive oil with cilantro and lime juice and zest. I ate some when flipping over and now can hardly wait until finished! Great timing. I just came home with 4 heads of cauliflower this afternoon. I plan to try all the versions this week. I love when that happens! Thanks so much, Linda. Be sure to report back on what you think! The Italian cauliflower was fantastic !! I just found this 2 weeks ago and have now made the ‘Mexican’ roasted cauliflower 3 times! I love cumin and pepitas, so tasty!! You do love it, then! Thanks for sharing, Nicky!